Oct. 16 (Bloomberg) -- Gold climbed, rebounding after its biggest decline in three weeks, as the dollar’s five-day slide boosted investor demand for the precious metal. Bullion is on course for its third weekly advance, having reached an all-time high of $1,070.80 an ounce on Oct. 14 as investors bought physical assets to hedge against the weaker dollar and the threat of inflation. Commodity-based exchange- traded funds have almost doubled assets under management since the end of 2008, Barclays Global Investors reported yesterday. Gold for immediate delivery rose as much as 0.4 percent to $1,053.88 an ounce and traded at $1,053.05 at 10:10 a.m. in Singapore. Prices slumped 1.2 percent yesterday as record prices and a recovery by the dollar prompted selling. December gold futures gained 0.3 percent to $1,053.90 an ounce on the New York Mercantile Exchange’s Comex division. The Dollar Index, a six-currency gauge of the greenback’s value, fell 0.2 percent to 75.34. Commodity assets in exchange-traded funds jumped to $19.7 billion in the third quarter from $9.9 billion at start of the year, Deborah Fuhr, head of ETF research at Barclays, said yesterday. Assets climbed 20 percent from the second quarter. Gold may decline next week as record prices erode jewelry demand and prompt some investors to sell, a survey showed. Nine of 16 traders, investors and analysts surveyed by Bloomberg said bullion would fall. Five forecast higher prices and two were neutral. Bullion may decline to $1,025 an ounce then slide further toward the psychologically important $1000 mark, Commerzbank AG said yesterday, citing recent trading patterns. “We can see that the market is coming off and the daily relative strength index has registered a bearish divergence,” Karen Jones said in a report. “We remain wary of failure” of a weekly close above $1,057 an ounce. Among other precious metals, silver rose 0.7 percent to $17.48 an ounce and palladium gained 0.2 percent at $326.25 an ounce. Platinum fell 0.1 percent to $1,349.50 an ounce. Oct. 16 (Bloomberg) -- Crude oil rose for a seventh day to $78 a barrel after jumping more than 3 percent yesterday on an unexpected plunge in U.S. gasoline and distillate stocks. Oil headed for its third weekly gain after inventories of the motor fuel tumbled 5.23 million barrels last week, almost five times the decline forecast by analysts and the biggest in a year according to Energy Department data. Gasoline output slumped 10 percent, the most in 13 months, as refiners slashed operating rates to their lowest since April. Crude oil for November delivery rose 39 cents, or 0.5 percent, to $77.97 a barrel in after-hours electronic trading the New York Mercantile Exchange at 8:10 a.m. in Singapore. It earlier reached $78, the highest since Oct. 14, 2008. The contract jumped 3.2 percent to $77.58 yesterday. Prices have gained 8.3 percent this week after the International Energy Agency and OPEC raised their 2010 demand forecasts and as resurgent equity markets emboldened investors and the sliding dollar steered funds into physical assets. U.S. gasoline supplies fell to 209.2 million barrels last week, leaving them 4.3 percent higher than the five-year average for the period, the department said yesterday. Refineries cut output of the fuel by 964,000 barrels a day to 8.45 million, the lowest since September 2008. Refiners often idle units for repairs and upgrades in October as gasoline demand drops and before heating-oil use increases with the northern hemisphere winter. Inventories of crude oil in the U.S. rose 334,000 barrels to 337.8 million, 10 percent more than a year earlier, the department said. Supplies were forecast to increase by 1 million barrels, according to the median of 14 analyst responses in the Bloomberg News survey. Oil imports fell 4 percent to 8.73 million barrels a day, the lowest in three months. Supplies of distillate fuel, including heating oil and diesel, fell for the first time in eight weeks to 170.7 million barrels, 34 percent more than a year earlier, according to the report. Stockpiles in the week ended Oct. 2 were the highest level since January 1983. While U.S. gasoline demand this month roughly matches the record levels seen two years ago, distillate demand is about 15 percent lower, Barclays said. Brent crude for December settlement climbed 36 cents, or 0.5 percent, to $76.59 a barrel, having jumped 3.2 percent yesterday. The November contract expired yesterday, rising 1.9 percent to $74.45 a barrel. Oct. 16 (Bloomberg) -- The yen fell, heading for a second weekly decline against the euro, on speculation Asian stocks will extend a global rally and before a U.S. report forecast to show industrial production expanded for a third month. The pound was set for its first weekly gain in a month versus the greenback on optimism the Bank of England will suspend asset purchases, easing concern it’s flooding the market with sterling. The dollar traded near a 14-month low against the euro amid speculation European Central Bank officials will today signal the bank may begin withdrawing unconventional policy measures, boosting demand for higher-yielding assets. The yen touched 136.03 per euro, its lowest level since Aug. 24, and traded at 135.84 per euro as of 8:50 a.m. in Tokyo from 135.35 in New York yesterday. The currency slid to as low as 90.99 per dollar, the weakest since Sept. 25, and was at 90.82 from 90.55. The dollar fetched $1.4955 per euro from $1.4947 in New York yesterday, when it declined to $1.4968, the lowest since Aug. 13, 2008. The U.S. currency fell to $1.6334 versus the pound from $1.6268. It earlier touched $1.6340, the weakest since Sept. 24. The Standard & Poor’s 500 Index and the MSCI World Index of shares each climbed 0.4 percent yesterday. The Federal Reserve will say today that U.S. industrial output rose 0.2 percent in September after gaining 0.8 percent in August, according to the median estimate of 77 economists in a Bloomberg News survey. Federal Reserve minutes this week showed some policy makers were open last month to boosting the central bank’s $1.25 trillion mortgage-backed securities purchase program. FKLI Oct Futures contract retrace 6 points lower at 1245.5 levels as compare to previous trading session to with a total of 4,556 lots traded in the market. FKLI was traded lower during trading session due some heavy profit taking activities after manage to surge heavily in previous trading session despite regional indices manage to trade higher during trading sessions. Technically, FKLI price manage to retrace 61.8% Fibonacci support levels at 1242.5 levels while maintain closing above the previous upper resistance trend line at 1246 regions. Based on our technical view, our opinion suggests FKLI would trigger major sell signal provided support level at 1233.5 and 1238 were violated during trading session. Traders were advice to hold long cautiously to ensure support levels were not violated while resistance levels were seen at 1250 and 1257 regions. CPO 3rd month Dec futures contract plunge RM50 lower as compare to previous trading sessions to close at RM2110 with a total of 7,272 lots traded in the market. CPO price was traded south despite soybean oil and crude oil overnight trading were traded firm during overnight trading but loss strength during electronic trading session. 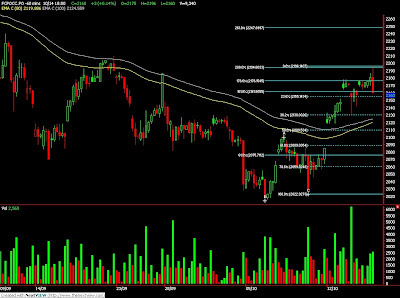 Technically, CPO price plunge after manage to rebound 50% Fibonacci resistance levels at RM2171. Based on our technical view, our opinion suggests CPO is possible to reach bottom around support levels at RM2100 and RM2089 regions. Bull trend were affirm to remain intact provided support levels at RM2089 were not violated. Traders were advice to hold long position in the coming trading sessions while be cautious around resistance levels at RM2130 and RM2150 regions. Oct. 15 (Bloomberg) -- Crude oil reached a one-year high in New York on optimism fuel demand will increase amid improved prospects for an economic recovery in the U.S., the world’s biggest energy consumer. Oil rose for a sixth day as the dollar declined and equities advanced around the world. Crude imports by China were 15 percent higher in September than a year earlier, according to a government report. Prices also climbed after a report from the American Petroleum Institute showed a decline in oil and gasoline stockpiles in the U.S. last week. Crude oil for November delivery gained 56 cents, or 0.7 percent, to $75.74 a barrel in electronic trading on the New York Mercantile Exchange at 10:45 a.m. Sydney time after earlier touching $75.90, the highest intraday price since Oct. 15, 2008. Yesterday, the contract rose $1.03 to $75.18, the highest close since Oct. 14, 2008. Prices are up 69 percent this year. Stocks advanced, sending the Dow Jones Industrial Average above 10,000 for the first time in a year on better-than- estimated earnings at JPMorgan Chase & Co. and Intel Corp. The Dow jumped 144.8 points, or 1.5 percent, to 10,015.86, the highest level since Oct. 3, 2008. Australia’s benchmark S&P/ASX 200 Index rose 1 percent to 4881.50 points at 10:21 a.m. Sydney time. The U.S. currency traded at $1.4933 per euro at 10:20 a.m. in Sydney, after depreciating 0.5 percent yesterday and reaching $1.4947, the weakest since August 2008. A weaker dollar increases the appeal of commodities as an alternative investment. U.S. stockpiles of crude oil fell 172,000 barrels to 339.2 million last week, according to a report from the American Petroleum Institute. Gasoline inventories declined 2.66 million barrels, the report showed. The Energy Department will probably report that crude-oil inventories rose by 1 million barrels in the week ended Oct. 9, according to the median of estimates from 13 analysts polled by Bloomberg News. Gasoline stockpiles probably climbed 1.13 million barrels, the survey showed. The Energy Department will release its weekly report today in Washington, a day later than usual because of the Columbus Day holiday on Oct. 12. China’s crude-oil imports climbed 15 percent to 17.2 million tons last month from a year earlier, while exports reached 390,000 tons, according to the customs bureau. Imports gained 8.2 percent to 146 million tons in the first nine months. The Organization of Petroleum Exporting Countries raised its 2010 global demand forecast Oct. 13 on expansion in emerging economies. The 12-member group predicted consumption next year will rise 0.8 percent to 84.93 million barrels a day. The International Energy Agency and U.S. Energy Department increased their demand projections this month. Brent crude oil for November settlement rose 70 cents, or 1 percent, to end the session at $73.10 a barrel on the London- based ICE Futures Europe exchange yesterday. It was the highest close since Aug. 24. Oct. 14 (Bloomberg) -- Gold prices declined in New York after a rally to a record spurred some investors to sell the precious metal. The 14-day relative-strength index for gold futures was above 70 for the third straight day, a signal that prices may retreat in the short term. Gold reached the all-time high of $1,072 an ounce as the dollar slumped to a 14-month low against a basket of six major currencies. The metal has closed above $1,000 every session this month. Gold futures for December delivery fell 30 cents to $1,064.70 an ounce on the Comex division. Earlier, the price dropped as much as 0.8 percent. President Barack Obama has increased U.S. marketable debt to a record as he borrows to reignite growth in the world’s biggest economy. Speculation has mounted that the increasing money supply will debase the currency and spur inflation. The Reuters/Jefferies CRB Index of 19 raw materials rose to an 11- month high today. The Federal Reserve has cut its main interest rate almost to zero and backed asset purchases and credit programs to combat the recession. Chairman Ben S. Bernanke is leading plans to buy mortgage-backed securities, federal agency debt and Treasuries. Silver futures for December delivery rose 6.8 cents, or 0.4 percent, to $17.908 an ounce. Earlier, the price reached $18.175, the highest for a most-active contract since July 2008. The metal is up 59 percent this year. FKLI Oct Futures contract surge fiercely 17 points higher at 1251.5 levels as compare to previous trading session to with a total of 3,818 lots traded in the market. FKLI was traded higher throughout entire trading session despite not much encouragement from regional indices other than Hang Seng indices. Technically, FKLI daily price chart manage to penetrate upper resistance trend line with previous resistance levels at 1246 regions. Based on our technical view, our opinion suggests FKLI would continue trade higher in the coming trading session provided nearest support levels at 1243.5 and 1233.5 were not violated during trading sessions. 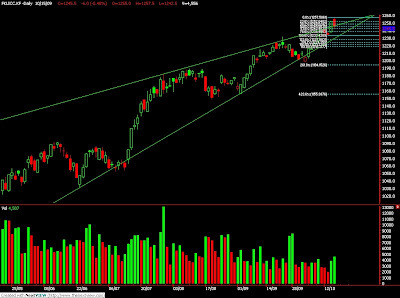 Traders were advice to continue to hold long position while place tight stop order around support levels. 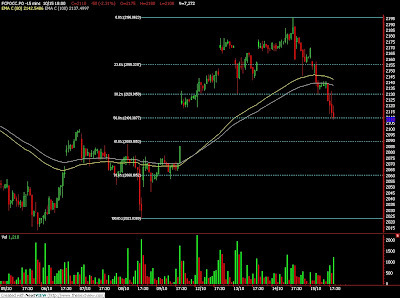 Resistance levels were seen at 1257 and 1265 regions. CPO 3rd month Dec futures contract traded marginally RM3 higher as compare to previous trading sessions to close at RM2160 with a total of 9,340 lots traded in the market. CPO price mainly traded within tight range expect last hourly trading hour CPO manage to swing upside and downside heavily possibly due to stop triggered and profit taking activities. Technically, CPO price was manage to penetrate 178.6% Fibonacci resistance levels at RM2177 but stop at RM2195 regions; 200% Fibonacci resistance levels. 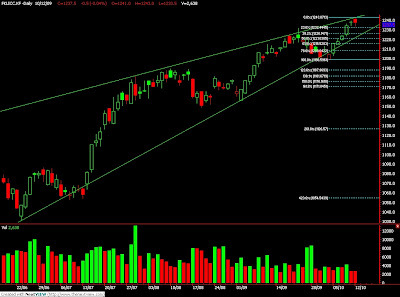 Based on our technical analyst, high at RM2196 indicates first confirmation on bull trend. However, bull trend would only remain intact provided support levels at RM2109 and RM2090 were not violated during trading session. Traders were advice to long on dip in the coming trading session while be alert around resistance levels at RM2210 and RM2240 regions. Oct. 14 (Bloomberg) -- Crude oil rose for a fifth day in New York after a forecast increase in world energy demand, and as the dollar weakened against the euro, increasing the appeal of commodities as an alternative investment. Oil gained 1.2 percent yesterday as the Organization of Petroleum Exporting Countries increased its 2010 global oil- consumption forecast on economic expansion in emerging economies. Crude also climbed as the dollar fell to the lowest level against the euro since August 2008. Crude oil for November delivery gained 75 cents, or 1 percent, to $74.90 a barrel in electronic trading on the New York Mercantile Exchange at 9:18 a.m. Sydney time. Yesterday, the contract rose 88 cents to $74.15, the highest settlement since Aug. 24. Prices are up 68 percent this year. Total crude consumption will increase by 700,000 barrels a day to 84.93 million barrels a day next year, led by demand from emerging markets, OPEC said in a monthly report yesterday. This year, the group forecasts demand will contract by 1.4 million barrels a day to 84.24 million barrels a day. The dollar traded at $1.4855 per euro at 9:06 a.m. in Sydney, after depreciating 0.5 percent yesterday and reaching $1.4876, the weakest level since Aug. 22, 2008. An Energy Department report is forecast to show that U.S. crude-oil and gasoline inventories increased last week according to a Bloomberg News survey. The department is scheduled to release its Weekly Petroleum Status Report Oct. 15 at 11 a.m. in Washington, a day later than usual because of yesterday’s Columbus Day holiday. The Standard & Poor’s 500 Index lost 0.3 percent to 1,073.19 in New York yesterday after rising for the previous six days, its longest streak of gains since June 2007. The Dow Jones Industrial Average fell 0.2 percent. Brent crude oil for November settlement gained $1.04, or 1.5 percent, to end the session at $72.40 a barrel on the London-based ICE Futures Europe exchange yesterday. Futures settled at the highest level since Aug. 28. Oct. 13 (Bloomberg) -- The dollar’s decline won’t turn into a crisis because of calls by central bankers for strength in the currency, the lack of a wholesale shift in reserve holdings and the absence of inflation, according to Bank of America Corp. The dollar declined today to the weakest level against the euro since before the bankruptcy of Lehman Brothers Holdings Inc. The U.S. currency fell as much as 0.7 percent to $1.4876 per euro, the lowest since Aug. 22, 2008. Shin forecasts that the dollar may weaken to $1.50 against the euro by year-end. The U.S. central bank has bought $297 billion in U.S. debt under a plan to purchase as much as $300 billion of Treasuries that is set to expire this month. Increasing concern over the dollar’s role as the global reserve currency won’t be the greenback’s downfall either because there aren’t any “genuine competitors,” Shin wrote. European Central Bank President Jean-Claude Trichet said Oct. 8 that a strong dollar is “important,” repeating previous remarks. Toyoo Gyohten, an adviser to Japan’s new finance minister, said the same day there is “no better alternative to the dollar.” Bank Rossii First Deputy Chairman Alexei Ulyukayev said Sept. 29 that Russia will keep buying Treasuries because there’s no realistic alternative. Oct. 14 (Bloomberg) -- The dollar traded near a 14-month low against the euro as signs the global economy is recovering spurred demand for higher-yielding assets. The dollar may decline against the pound for a second day before a government report forecast to show U.S. consumer prices gained last month, curbing demand for safe-haven assets. The yen weakened against the greenback on speculation the Bank of Japan will keep interest rates unchanged today amid the nation’s fragile economic outlook. The U.S. currency traded at $1.4846 per euro at 8:59 a.m. in Tokyo from $1.4854 in New York yesterday, when it reached $1.4876, the weakest level since Aug. 22, 2008. The yen was at 133.37 per euro from 133.26. The yen fell to 89.84 per dollar from 89.71. The dollar was at $1.5937 per pound from $1.5925. The dollar may weaken as economists in a Bloomberg News survey forecast U.S. consumer prices rose 0.2 percent in September following a 0.4 percent gain in August. The Labor Department is set to release the data tomorrow. Japan’s central bank will leave its benchmark interest rate at 0.1 percent today, according to all 20 economists surveyed by Bloomberg News. The nation’s producer prices fell for a ninth month in September as oil traded lower than last year’s levels and demand for materials waned, the Bank of Japan said today. The costs companies pay for energy and unfinished goods declined 7.9 percent in September from a year earlier after sliding a record 8.5 percent in August. The median estimate of 27 economists surveyed by Bloomberg News was for a 7.9 percent drop. Japan’s consumer prices excluding fresh food slid 2.4 percent in August from a year earlier, topping July’s 2.2 percent decline, the statistics bureau said on Sept. 29. The drop was the sharpest since the survey began in 1971. Federal Reserve Vice Chairman Donald Kohn said yesterday that inflation and growth will probably stay below the central bank’s objectives for some time, warranting very low interest rates for an “extended period.” The bank is scheduled to release the minutes of its Sept. 23 meeting today in Washington. The Dollar Index, which IntercontinentalExchange Inc. uses to track the greenback against the currencies of six major U.S. trading partners, dropped 0.1 percent to 75.877. Oct. 13 (Bloomberg) -- Palm oil gained for a third day after exports from Malaysia, the second-largest producer, increased in the first ten days of the month and on forecasts for a decline in output from a seasonal high. Shipments, rose 3.9 percent to 345,393 metric tons in the first 10 days of October compared with the previous month, ociete Generale de Surveillance, an independent cargo surveyor estimated yesterday. The gain was 8.3 percent to 339,195 tons, rival surveyor Intertek said. September production rose 4.1 percent from August to the second-highest level on record, according to Malaysian Palm Oil Board data. “Industry players have indicated that they expect crude palm oil production to peak in September or October,” an AMResearch Sdn. report said today. Production should start to “soften” toward the end of the year, the report said. December-delivery palm oil on the Malaysia Derivatives Exchange, which had the biggest gain in two weeks yesterday, rose 0.5 percent to 2,157 ringgit ($636) a ton. Typically Malaysian palm oil production peaks in the third quarter, with 55 percent of annual output in the second half. This year’s peak was delayed by rains that affected fruiting. “For the full year, the Malaysian Palm Oil Board is forecasting palm oil production at 17.6 million tons, 4 percent lower than their previous estimate of 18.4 million ton and flat compared to last year,” AMResearch said. Output in September was 1.56 million tons, according to palm oil board data yesterday. The tropical oil also rose after rival soybean oil surged 3.8 percent in Chicago trading yesterday, the biggest gain in two months. Soybean oil traded at 36.96 cents a pound at 2:29 p.m. Singapore time. The premium of soybean oil to palm oil was 24 percent today, compared with 28 percent yesterday, according to Bloomberg data. Oct. 13 (Bloomberg) -- Oil fell from a seven-week high in New York on forecast of an increase in U.S. crude stockpiles, bolstering skepticism about the pace of recovery in the biggest energy-consuming nation. Oil pared yesterday’s 2.1 percent gain before an Energy Department report that may show U.S. crude-oil inventories climbed 1 million barrels last week, according to the median of 11 analyst responses in a Bloomberg News survey. “Crude oil supply is well above the five-year average,” said Mark Pervan, a senior commodity strategist at ANZ Banking Group Ltd. in Melbourne. Crude oil for November delivery dropped as much as 44 cents, or 0.6 percent, to $72.83 a barrel, in electronic trading on the New York Mercantile Exchange, and traded at $72.94 at 10:40 a.m. Singapore time. Yesterday, the contract rose $1.50 to $73.27, the highest settlement since Aug. 24. Prices are up 63 percent this year. U.S. refiners often idle units for repairs and upgrades in October as gasoline demand drops and before heating-oil use rises. Crude-oil imports fell 4.6 percent to 9.1 million barrels a day in the week ended Oct. 2. “When you look at the supply backdrop, it is pretty large in the U.S.,” Pervan said. “U.S. inventory data, for me, is probably going to be weak” this week, he said. Supplies of distillate fuel, a category that includes heating oil and diesel, declined 200,000 barrels from 171.8 million the prior week, according to the survey. Stockpiles in the week ended Oct. 2 were at the highest level since January 1983. Six of the respondents predicted a decline and five said there was a gain. Gasoline stockpiles probably rose 1.5 million barrels, the survey showed. The Energy Department is scheduled to release its weekly report on Oct. 15 at 11 a.m. in Washington, a day later than usual because of the Columbus Day holiday. The Standard & Poor’s 500 Index advanced 0.4 percent to 1,076.19 in New York yesterday, above its highest close since Oct. 3, 2008. The Dow Jones Industrial Average rose 0.2 percent. The MSCI World Index of 23 developed nations climbed 0.5 percent to its highest closing level since Oct. 1, 2008. Australia’s benchmark S&P/ASX 200 Index gained 0.9 percent at 1:01 p.m. Sydney time. Brent crude oil for November settlement declined as much as 52 cents, or 0.7 percent, to $70.84 a barrel on the London-based ICE Futures Europe exchange, and was at $71.12 at 10:37 a.m. Singapore time. Yesterday, the contract rose $1.36, or 1.9 percent, to end the session at $71.36. Oct. 13 (Bloomberg) -- The yen traded near a two-week low against the euro as optimism the global economic recovery is on track curbed demand for safe-haven currencies. The yen dropped against 12 of its 16 major counterparts as Asian stocks extended a global rally amid speculation corporate earnings are recovering. The New Zealand dollar rose as a government report showed the South Pacific nation’s retail sales gained in August by the most since 2007. The yen was at 132.71 per euro at 11:38 a.m. in Tokyo from 132.72 in New York yesterday, when it touched 133.32, the weakest level since Sept. 25. Japan’s currency traded at 89.84 per dollar from 89.82. The dollar was at $1.4773 per euro from $1.4773 in New York yesterday. Japan’s Nikkei 225 Stock Average rose for a fifth day and the MSCI Asia Pacific Index of regional shares advanced 0.4 percent. The Standard & Poor’s 500 Index rose to a one-year high in New York yesterday after Black & Decker Corp. raised its third- quarter profit forecast and Ford Motor Co. said European sales climbed 12 percent last month. “Any repeat of the broadly positive earnings surprises seen in Q2 is likely to lead to further gains for commodity currencies at the expense of the U.S. dollar,” Gareth Berry, a currency strategist in Singapore at UBS AG, wrote in a report. The European Union’s statistics office in Luxembourg is forecast to report industrial production in the 16 nations that use the euro gained 1.2 percent in August after dropping 0.3 percent in July, according to the median estimate of 32 economists in a Bloomberg News survey. The data is due tomorrow. The New Zealand dollar advanced against all 16 major counterparts as the nation’s retail sales gained 1.1 percent in August after dropping 0.5 percent in July. Economists projected a 0.5 percent gain. Reserve Bank of New Zealand Governor Alan Bollard on Sept. 10 said he doesn’t plan to raise benchmark interest rates until the “latter part” of 2010. The New Zealand dollar advanced 0.4 percent to 73.63 U.S. cents from 73.33 cents. Australia’s currency was little changed at 90.69 U.S. cents. It earlier touched 90.95 cents, the strongest since August 2008. Australia last week became the first among Group of 20 economies to raise borrowing costs since the beginning of the financial crisis. Futures markets show a more than 90 percent chance that the Reserve Bank of Australia will raise rates to 3.75 percent by year-end. Benchmark interest rates of 3.25 percent in Australia and 2.5 percent in New Zealand compares with as low as zero in the U.S., making the South Pacific nations’ assets attractive to investors seeking higher returns. The risk in such trades is that currency market moves will erase profits. CPO 3rd month Dec futures contract surge RM62 higher as compare to previous trading sessions to close at RM2147 with a total of 11,693 lots traded in the market. CPO price was traded most of the time as soybean oil and crude oil electronic trading were traded strong during electronic trading as well as overnight trading sessions. 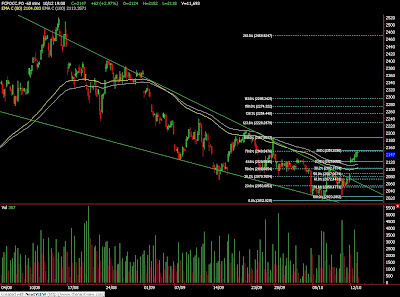 Technically, CPO price seems manage to break out from the falling wedge that formed in the daily chart and seems stopped around 78.6% Fibonacci resistance levels. Based on our technical view, our opinion suggests CPO price would remain intact on bull rally provided support levels at RM2100 and RM2070 must not be violated during trading sessions. Traders were advice to long on dip if CPO price didn’t manage to penetrate resistance levels at RM2154 and RM2187 in the coming trading sessions. FKLI Oct Futures contract traded marginally 0.5 points lower at 1237.5 levels as compare to previous trading session to with a total of 2,638 lots traded in the market. FKLI was traded lower during trading sessions due to Hang Seng Equity indices were traded lower despite manage to open high during morning sessions as Dow Jones was settle firm during last week trading. 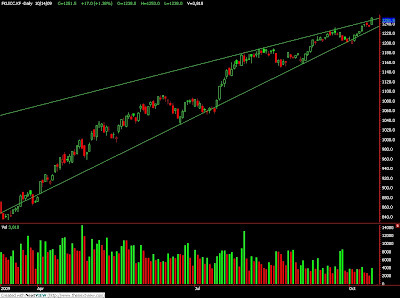 Technically, FKLI retrace after reach upper resistance trend line around 1244 regions that formed in the daily chart. Based on our technical analyst view, our opinion suggests FKLI would likely to trade lower in the coming trading session provided resistance levels at 1240 and 1248 were not violated duding trading session. Traders were advice to hold short position in the coming trading session while be cautious around support levels at 1233 and 1225. Oct. 12 (Bloomberg) -- Palm oil stockpiles in Malaysia, the world’s second-largest producer, rose 12 percent in September from August to the highest in eight months. Inventory of the edible oil, used mostly in cooking, gained to 1.58 million metric tons, the Malaysian Palm Oil Board said in a statement today. That’s the highest since January when stockpiles reached 1.83 million tons. Rising supplies may help to curb a 26 percent gain in palm oil futures this year. The December-delivery contract on the Malaysia Derivatives Exchange advanced 2.1 percent to 2,129 ringgit ($625) a ton at the 12:30 p.m. trading break before the data was released. Output climbed 4.1 percent to 1.56 million tons, the second highest on record, the board said. Monthly production reached an all-time high of 1.66 million tons in November 2008. Exports dropped 0.4 percent to 1.31 million tons, the data showed, the second straight month-on-month decline. Indonesia and Malaysia account for almost 90 percent of the world’s palm oil output. Indonesia doesn’t release monthly data. Oct. 12 (Bloomberg) -- Crude oil rose for a third day on speculation fuel demand will increase as the global economy emerges from recession. Oil climbed after U.S. equity markets reached their highest in a year Oct. 9, fanning hope for a recovery in world energy consumption. An Investors Business Daily survey due tomorrow in the U.S., the world’s largest energy user, may show consumers were optimistic for a third month, according to economists surveyed by Bloomberg News. “We are looking at an international economy that is going to be stronger in 12 months’ time,” said David Moore, a commodity strategist at Commonwealth Bank of Australia Ltd. in Sydney. “There’s that conviction that things are going to be better down the track” even when some data is not “especially supportive,” he said. Crude oil for November delivery climbed as much as 79 cents, or 1.1 percent, to $72.56 a barrel in electronic trading on the New York Mercantile Exchange. It was at $72.23 at 9:26 a.m. Singapore time. Futures have gained 62 percent this year. Oil added 8 cents to $71.77 a barrel Oct. 9, the highest settlement since Sept. 18, after the International Energy Agency upgraded its 2010 demand forecast for a third month. Prices rose for a second week as the Standard & Poor’s 500 Index rallied and the Dollar Index slipped to a one-year low, bolstering the investment appeal of commodities. Oil prices between $60 and $80 a barrel are suitable for exporters and importers, Kuwaiti Oil Minister Sheikh Ahmad al- Abdullah al-Sabah told state-run news agency KUNA yesterday. Kuwait is a founding member of the Organization of Petroleum Exporting Countries, which pumps about 40 percent of the world’s crude. U.S. stockpiles of distillate fuel, including heating oil and diesel, are at their highest since January 1983, according to Energy Department data. Gasoline inventories climbed 2.94 million barrels to 214.4 million as refiners boosted output, the department said Oct. 7. Brent crude oil for November settlement rose as much as 56 cents, or 0.8 percent, to $70.56 a barrel on the London-based ICE Futures Europe exchange. It was at $70.48 a barrel at 9:27 a.m. in Singapore. The contract gained 0.3 percent to $70 a barrel Oct. 9, the highest settlement since Sept. 22. The dollar was close to a one-year low versus its Canadian counterpart before U.S. reports this week that may show retail sales fell in September while factory production cooled, adding to signs the U.S. may trail other countries in emerging from recession. Australia’s dollar traded near its highest since August 2008 versus the greenback as traders increased bets the central bank will raise interest rates. The yen traded at 132.38 per euro as of 10:14 a.m. in Tokyo from 132.25 yen in New York on Oct. 9 after earlier touching 132.48 yen, the lowest level since Sept. 25. It was at 90.08 per dollar from 89.78. Japan’s currency traded at 81.32 versus the Australian dollar from 81.12. The U.S. currency fetched C$1.0444 from C$1.0422 in New York on Oct. 9, after falling to C$1.0407, the weakest level since Sept. 29, 2008. Australia’s dollar traded at 90.27 U.S. cents from 90.37 cents. It reached 90.90 cents on Oct. 8, the most since August 2008. Foreign-exchange movements may be more exaggerated than usual in Asia as national holidays in the U.S., Canada and Japan reduce liquidity, said Yoshida. Germany’s ZEW Center for European Economic Research will say its index of investor and analyst expectations, which aims to predict developments six months ahead, rose to 58.8 in October, the highest since April 2006, from 57.7 in September, according to a Bloomberg News survey of economists. Benchmark interest rates are 0.1 percent in Japan and as low as zero in the U.S., compared with 3.25 percent in Australia and 1 percent in the euro-zone. The dollar weakened versus Canada’s currency before U.S. reports this week estimated to show the recovery in the world’s largest economy will be slow, backing the case for the Federal Reserve to keep interest rates low. U.S. purchases dropped 2.1 percent in September after rising 2.7 percent in August, according to a Bloomberg News survey of economists before the Commerce Department releases the report on Oct. 14. Industrial production expanded 0.1 percent in September after increasing 0.8 percent in August, a separate Bloomberg survey showed before the Fed’s report on Oct. 16.